on the current asteroid mission of NASA. 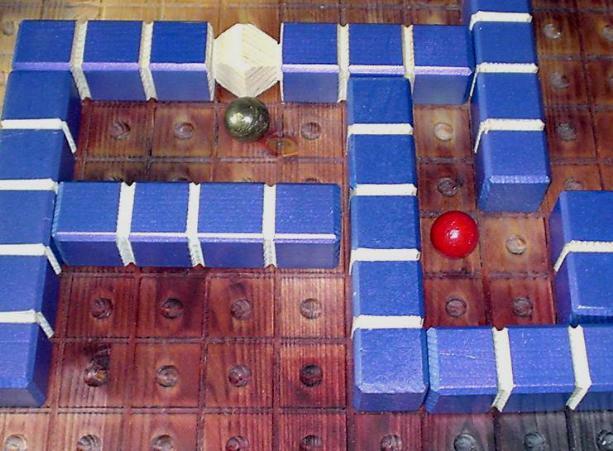 Game design by Ingo Alth�fer, Copyright July 2007. Vesta and Ceres are two icons of the asteroid belt. On September 27, 2007, the space probe DAWN was started from Cape Canaveral. DAWN is intended to arrive at asteroid No.4 Vesta in August 2011, making science there for about eight months, and then flying on to dwarf planet (and asteroid No.1) Ceres. Arrival at Ceres is scheduled for February 2015, and there another science period of several months is planned. In the game, the two players are "Nature" and "Mission Control". Nature is driving the asteroids, whereas Mission Control tries to advance science by fixing the asteroids. So, a sort of divide-and-conquer duel is played, with rather asymmetric roles for the players. 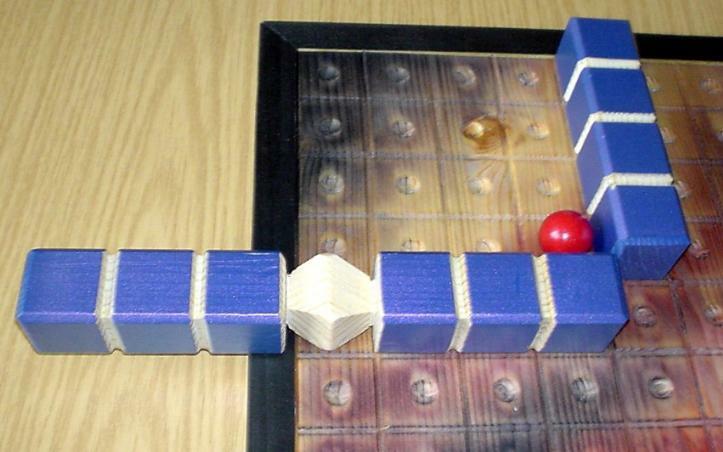 A rectangular playing board, two balls representing Vesta and Ceres, 2 x 6 bars, a special six-sided die. 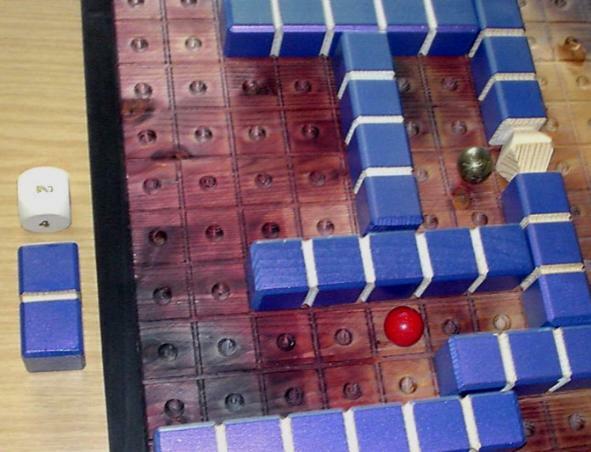 The board has 11 x 15 squares. The two asteroids "Vesta" (in red) und "Ceres" (brownish) obey player Nature. Player "Mission Control" controls two sets of six bars each, with lengths 2, 3, 4, 5, 6, and 7. The bars of length 7 have a special shape, inspired by the shape of the DAWN probe. The die carries the symbols 2, 3, 4, 5, 6, and DAWN on its six faces. The board is placed flatly on the table. In the beginning, it is completely empty. The two players negotiate who takes the roles of Nature and Mission Control in game 1. Nature gets the asteroids and the die, and puts Ceres aside for the time being. Mission Control gets all twelve bars and sorts the two sets apart. One set, consisting of one bar for each length 2, 3, 4, 5, 6, 7, will be used in Phase 1. The other set is meant for the second phase. Nature enters the asteroid Vesta on any square of the board. (a) Nature rolls the die. (b) Mission Control places a "new" bar of appropriate length on the board. (c) Nature moves Vesta by "some" elementary steps. The maximum number of steps is given by the length of the bar just inserted by Mission Control. On (a): The symbol DAWN on the die stands for length 7. On (b): When the die shows a number whose bar has not been inserted yet, exactly this bar is to be placed by Mission Control. However, if this bar is "in" already, from the set of remaining bars the next smaller length or the next larger length has to be inserted. Example: 4 has been rolled, but only the bars of lenghts 3, 6, 7 are still available. Then either the 3-bar (next smaller) or the 6-bar (next larger) may be inserted. By the way, in round 6 only one "new" bar remains. So, it is in principle superfluous to roll the die in this round. A bar may be placed only on free parts of the board, in one of the following three orientations: vertically flat, horizontally flat, or upright. In the two "flat" orientations the number of squares needed is just the bar's length. In case of "upright" orientation this bar occupies exactly one square of the board. One special rule holds for the DAWN-bar (with length 7): it is allowed to jut out at a boundary of the board (see picture). On (c): A movement of Vesta consists of a sequence of elementary steps. Each elementary step goes one square in orthogonal direction (either to the north, to the east, to the south, or to the west) on a free square. Elementary steps in diagonal direction are not allowed. The length of the bar just entered in (b) prescribes the maximum number of elementary steps. However, Nature is free to make less steps. Especially, remaining on its square without movement is also allowed. After Phase 1 is finished, Nature places Ceres on any free square of the board. Vesta and all the bars from Phase 1 remain on their positions. This phase consists of six rounds, too. Each round again has three actions (a), (b), (c) which are executed one after the other. (c) Nature moves Ceres by "some" elementary steps. The maximum number of steps is given by the length of the bar just inserted by Mission Control. For (a), (b), and (c), the explanations from Phase 1 hold. In addition, the following rules concern (c): Ceres is not allowed to move above Vesta. Vesta is totally immobile in Phase 2. Counting: How much Freedom is left for the Asteroids? 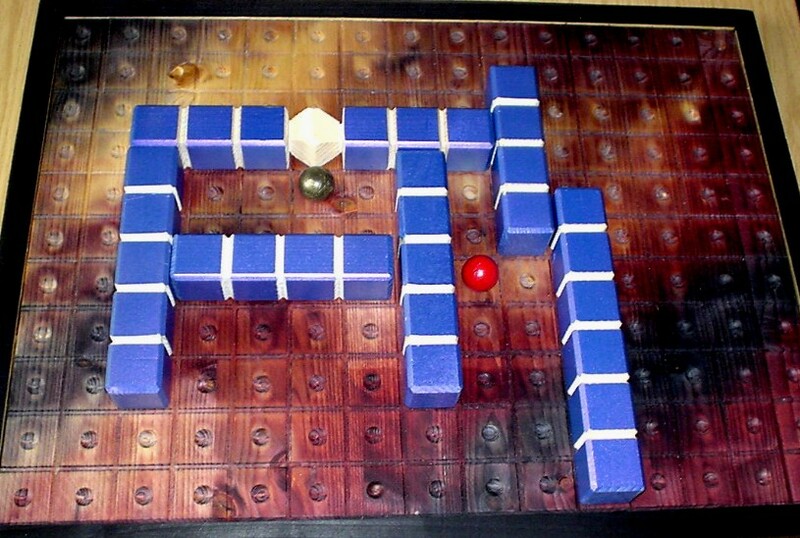 First of all the players determine how many free squares still can be reached by Ceres in elementary steps, without climbing above Vesta or above any bars. This number is called F(C). Analogously, it is determined how many free squares still can be reached by Vesta without climbing above Ceres or above any bars. This number is called F(V). or in short: Result = max + (max - min). Ceres and Vesta share 10 free squares. There is one additional free square, reachable only for Vesta. F(C)=7 and F(V)=5 give result 7 + (7-5) = 9. F(C)=10 and F(V)=11 give result 11 + (11-10) = 12. F(C)=8 and F(V)=8 give result 8 + (8-8) = 8. F(C)=0 and F(V)=6 give result 6 + (6-0) = 12. Typical scores for single games are between 3 and 18. The result of the first game is noted. Then a second game is played with roles interchanged. Overall winner is the player who has the better score in comparison. * Vesta should be inserted on a more or less central square. * After Phase 1 the board has already some divide-and-conquer structure by the bars from the first set. Nature should put Ceres in one of the larger compartments. * Sometimes Nature should try to provoke situations where in the endgame the bars of Mission Control are too long to be good blockers. * Mission Control should reach for two things: limiting the freedom of Vesta and Ceres, and doing this in a way as balanced as possible. Question: When the 2-bar is the very last one to be entered: where should Mission Control place it? Probably skilled players will soon find better and more sophisticated hints. Feedback with sketchy comments (and notations of nice games) is very welcome, at the email address given in the head of the rules. 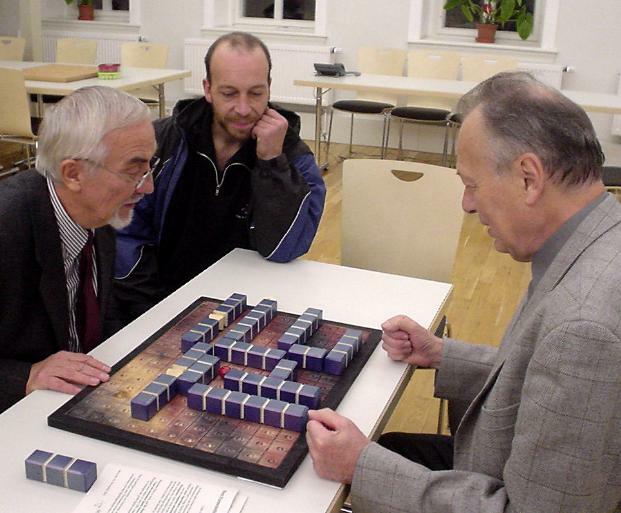 * Astrophysicists Dr. Freimut B�rngen (left) and Dr. Johann Dorschner (right), both from Thuringia, were the actors in the premiere of the game. * The game DAWN 11/15 has a predecessor, namely "Ceres and Gauss - the Goddess and the Mathematician". 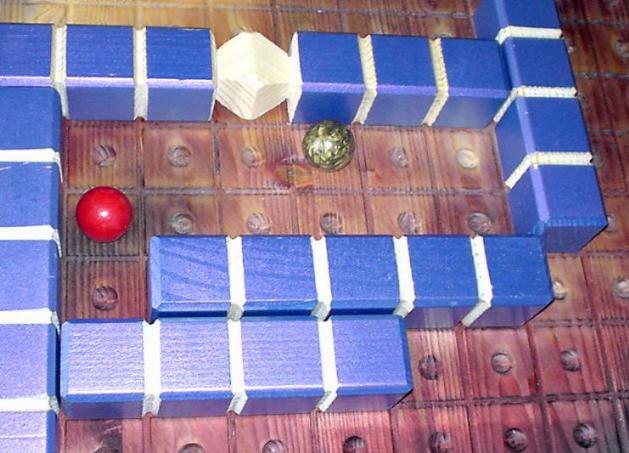 This game belongs to the collection "Play Gauss" by Reinhold Wittig and Ingo Althöfer. Carl Friedrich Gauss was a famous mathematician who successfully computed the orbit of Ceres. During the exhibition "Gott w�rfelt nicht" in G�ttingen, in summer 2005, "Ceres and Gauss" could by played on top of a large table. See the picture. * Sincerest thanks go to Matthias Sick from the "Sam Lloyd AG" for designing the very nice unique copy of DAWN 11/15! He can be seen in the middle of the Boerngen-Dorschner picture above.